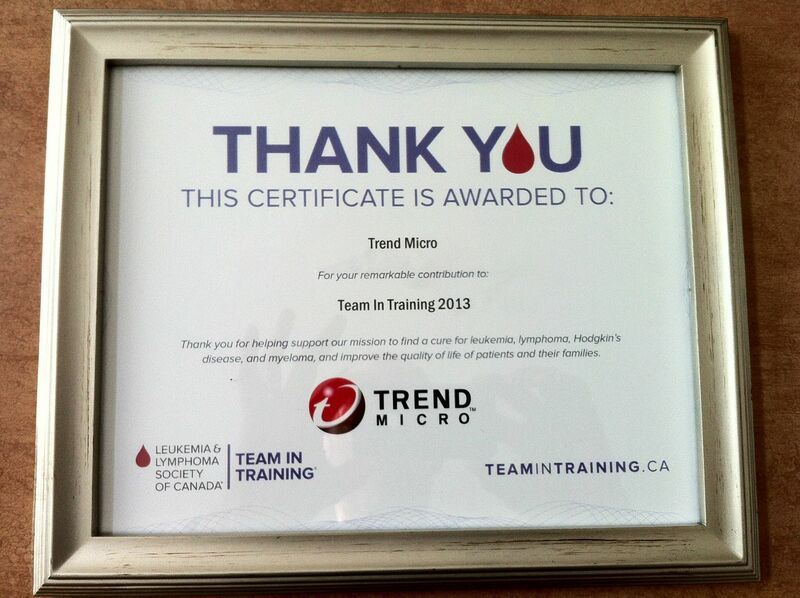 If you are reading this, you know that I’m a runner and a fervent supporter of Team in Training (TNT), a program sponsored by the Leukemia & Lymphoma Society of Canada (LLSC). TNT comprises a group of endurance athletes who raise funds for the LLSC by running in half and full marathons. 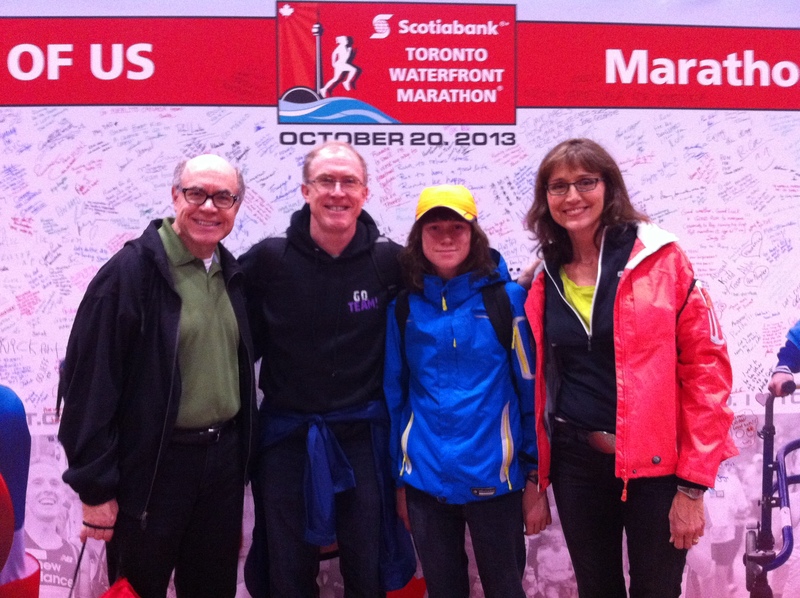 Last Sunday, I ran the Scotiabank Toronto Waterfront Half-Marathon – my third TNT event. I’m not new to half-marathons: this was the sixth I have run, and the second Scotiabank event. So I knew the course, and what to expect. I also knew that last year, in similar shape/condition, I ran the half in 1:39:53. I was pretty confident I would be in the 1:40-1:42 zone this year without too much effort at all – maybe even in personal best territory, depending on conditions. It was what I didn’t know – yet – that tripped me up. I was getting my usual pre-run coffee at Starbucks, when I suddenly broke into a very big sweat – trickling down my forehead, neck, back and chest. But I wasn’t even running – I was just standing there with my coffee. Weird. Weirder still, was the fact that I had to pee four times in the hour leading up to the gun. Again, unusual – having been down this road many times before. For the first 9k or so of my race, my split times were pretty normal – about 4:40-4:45 kilometre splits, just a tad ahead of pace with my usual performance – which made sense because of a favourable slight downhill slope for that part of the race, and ideal race conditions (cool, dry, little wind). But then, all the wheels fell off – at once. My breathing became quite laboured, and I started losing power in my legs … all within a span of about 400 meters. The ability to breathe is somewhat essential to running 21.1km, so I pulled over (something I never do in a race) to take my ventolin inhaler. And oh yeah, I had to pee – AGAIN – so I did (again, something else I never do in a race). I started up again, but could not regain my former pace without difficulty breathing. By kilometre 11, I decided to give up on any sort of personal best, and dial back my pace to a point where breathing was sustainable without distress. My splits then deteriorated – from a low of 4:34/km (kilometre 5), to as high as 5:37/km (kilometer 18) – the latter pace being slower than the pace I can easily sustain for my long SLOW runs. I managed to find a reserve of energy in the last two kilometres – spurred on by the crowd and my family watching – and salvaged a respectable 1:48:08 in the half. Respectable, yes – but almost 10 minutes over my PB. After the race, I finally allowed myself to feel what was REALLY going on with my body, and quickly realized that I had the flu. I’ve spent three days on my back since. But it explains everything: the sweats, the peeing, the respiratory distress, the lack of strength in the muscles of my legs. Most important, the race was merely the endpoint of a journey that started in May, when I signed up for my third TNT event. That journey included meeting all sorts of new friends, forming a corporate TNT team (the Trend Micro Trotters), and having my corporate team earn over $30,000 for the LLSC. I ran this race for friend Rachel Schmidt, who underwent a life-saving bone marrow transplant 15 months ago after her bout with leukemia. The money we raise will help people like Rachel in the future – giving them hope that a cure will be found for blood cancers like leukemia, lymphoma, myeloma and Hodgkin’s disease. Secondarily, I now know that I can run a half-marathon in well under two hours, even when ill. And I’m turning 50 in March. Not a bad scenario, all things considered. I’ll take it and am grateful for it. For the record: I am an asthmatic. In grade school, I was always the sickly kid who rarely took part in sports and was teased about it. It became such an issue that I didn’t take gym in high school for fear of being singled out by the cooler (and often, cruel) jocks. It’s unfortunate to have limited my choices earlier in life due to a medical issue, but now I know better. Perhaps that’s why I’m so crazy about long-distance running. It’s a way at this point in my life to flip asthma the bird, retroactively. Next up: I’m going to run the full Ottawa Marathon on May 25, 2014. And yes, I’ll be running it for TNT, to raise more money for the LLSC. So you’ll be hearing from me in the New Year, as I embark on a new journey. Thanks to each and every one of you for all the support and encouragement you’ve given me and TNT/the LLSC thus far – it means so much.